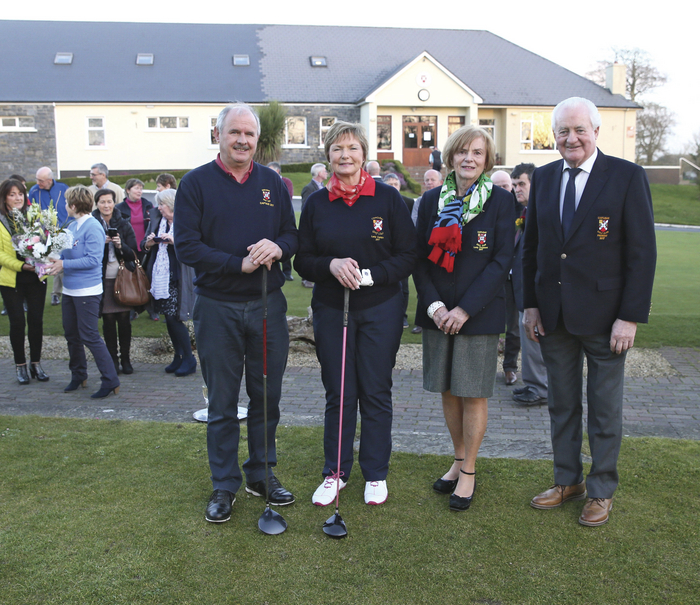 Ready for new season: Gents' captain Noel Burke and lady captain Marian Martyn pictured with lady president Ann McGovern and president Michael O'Malley at the Captain's Drive In at Castlebar Golf Club. Photo: Michael Donnelly. Aine MhicSuibhne was the winner of the ladies' stableford competition with a score of 33pts last weekend, she edged out Geraldine Evans into second place after she finished with a score of 32pts, with third place going to Julie Loftus. The gents' stableford competition was claimed by Paul Murtagh who scored 38pts for his round last weekend. Second place was taken by Martin Moylette who just edged out Michael Neary for second place after both men finished with a score of 37pts, with Moylette's back nine play seeing him take second spot. The Captain's Drive in will take place on Sunday, March 26. The Captain's/ President's Drive in took place last weekend and the winner of the competition to mark it was the foursome of John Lydon, Martin Hughes, Kevin Naughton, and Martain Summerville who scored 57.3pts for their round. Second place went to the team of Ray Darcy, Garry O'Shaugnessy, Dean Hacker, and Niamh Darcy who scored 57.4pts. Third place was taken by the grouping of Oliver Walsh, Tony Humphries, Penny Eustace, and Richard Stiles who went around the course in a score of 58.3pts. Liam Freeman was the winner of the gents' competition with a score of 43pts last Sunday, Tom Marren finished in second place two points further back and John Coyne came home in third place. The ladies' competition was won by Anne Hussey who scored 37pts for her round, she finished just in front of second place finisher Kay Buckley thanks to her back nine play. Third place was claimed by Siobhan Herr who had a score of 35pts on the day. Last weekend was the final of the Winter League competition and the winners with a brilliant score of 104pts was the team of Padraic Rice, Sean Haugh, Jim McGovern, and Seamus Gordon. Just two points behind that foursome in second place was the team of John McHale (Tom Moylett sub ), Ian Brennan, Frank Murray, and Padraic Gibbons. The third team home was the team of Ian McDonagh, John MacDonagh, Ronan Waldron Jr, and David Staunton who finished up with a score of 102pts. The nearest to the pin competition last weekend, was won by Ioseph McGowan for his shot on the 16th hole. In the ladies' Spring League final, Mary Lawlor led home her team to victory, alongside her teammates Mary Rose McNulty, Mary Caulfield, Terri Fahy, and Fiona Lynn. Second place went to the team of Patricia Walsh, Connie White, Mary Glynn, Mary McHale, and Cathy Craughwell, with the third place going to the team captained by Una Lydon, along with her teammates Margaret Tighe, Breege Flynn, Mary Martin, and Fiona Rowland. The top overall points scorer in the competition was won by Marian Martyn. Last weekend's gents' competition was won by Pat McGuinness who scored 36pts and took the win thanks to his back nine play, the Cat 1 win went to Alan Ferrick who shot a score of 35pts, with Philip White taking the Cat 2 crown, while Thomas Mannion won the Cat 3 grade, and Frank Curley was the winner of the Cat 4 section. The ladies' competition was won by Carmel Kilgallon who scored 35pts for her round, and Pat Dillon was the nine hole ladies' competition winner. Mulranny golfers turned out in large numbers on Sunday to support the Captains’ (John McNamara and Nicola Sheridan ) and Presidents' (John Feeney and Patsy Mulchrone ) Drive In. A three ball scramble held after the drive in was won by team of Maeve Nevin, Peter Hopkins, and Vinny Gannon who scored 30pts. Second place was claimed by the trio of Nicola Sheridan, John McNamara, and John Feeney, and third prize was taken home by the team of Martin O'Carroll, Peter Sheridan, and Pat O'Malley. The open weekend competition was won by Claremorris player Conor McGuinness who scored 39pts, second place went to fellow Claremorris man James Prendergast a point further behind, and third place was claimed by local player Patsy Noone. There are just three open weekends left before the grand final of the open weekend competition which will take place on the weekend of Saturday, April 8, and Sunday, April 9. The ladies' competition last weekend was won by Esther Munnelly who scored 19pts for her round, with second place going to Catherine Loftus who finished one point further behind.